As in The Rose, Midler’s first starring role and also a blockbuster quasi-biopic, the film is fiction. However, actress/singer Martha Raye believed that Midler’s character was based on many widely known facts about her life and career with the USO and pursued legal action based on that assumption. After a protracted legal engagement, Raye ultimately lost the case. The Caan character was generally believed to be based on Bob Hope. Betty Hutton, Great Ladies of Song, Spotlight On Betty Hutton, Capitol CDP 0777 7 89942 2 0. 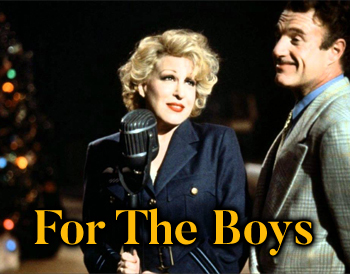 Bette Midler, FOR THE BOYS, Motion Picture Soundtrack, Atlantic 7 82329-2. The King Sisters, Swingin’ On A Star, Collector’s Choice Music, CCM-242.